← Can a Disabled War Veteran Hunt with a Canine Companion? Lights at night to monitor wildlife behavior and movement? Answer: It is not illegal to shine lights since you won’t have a “method of take” with you, but your activities could alert a game warden who might think you are using the spotlights to poach game at night. Be aware that there are vehicle code laws that prohibit shining a hand-held spotlight from a motor vehicle, and another provision that requires “off road” lights to be covered while traveling on a public roadway or highway. Instead, you might consider using a trail cam like those sold through most outdoor gear stores. These will allow you to capture (via night vision equipment) images or video of wildlife that might be visiting a watering hole or passing through an area where the camera could capture their image. There are some cameras that take photos when a light sensor is tripped and some that take photos at certain time intervals. 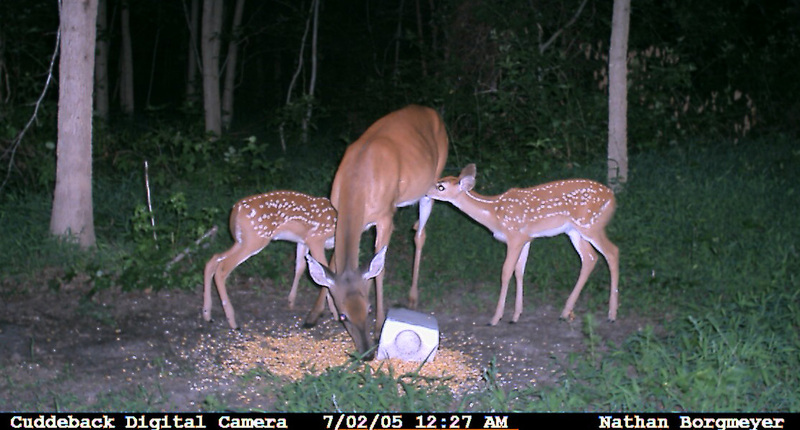 The trail cams would not bother or harass the wildlife and you’d be able to capture them while they are act ingnormally, doing whatever they are naturally doing at night. You might also be surprised by the different species that will appear that you probably were not expecting! How much help for a legally blind angler? Answer: Yes, as long as you are just assisting and not controlling the rod or reeling the fish in for her, you will not need a fishing license or second rod stamp. When fishing catch-and-release for ocean fish, what’s the limit? Answer: No. If you have taken and retained your limit of salmon, or any other limit of fish, you cannot continue fishing with gear and methods that will most likely target those fish. According to California Department of Fish and Game (DFG) Lt. Dennis McKiver, if you were to do this, by law you are attempting to take more salmon. “Take” is defined by law to include hunting, pursuing, catching, capturing or killing, or attempting to hunt pursue, catch, capture or kill (Fish and Game Code, section 86 and California Code of Regulations, section 1.80). If you are in possession of a limit of salmon, you may not attempt to catch additional salmon. If you do, you could be subject to a citation if you are targeting salmon while you are in possession of your limit of salmon. In addition, salmon are not good candidates for catch and release fishing because they are highly susceptible to hooking mortality, so it is important to stop salmon fishing when you reach your limit. Can a non-hunter carry an unloaded shotgun when with other hunters? Answer: While it may not technically violate the law for you to carry an unloaded shotgun without a license, by doing this with others who have ammunition and are taking game, it will likely generate many questions by the game warden contacting you in the field. Whether or not you have a hunting license is not an element of “take.” You may argue you are not taking game, but the warden has sufficient evidence to prove you are. Do you really want to put yourself through the hassle of going to court? Leave the firearm behind if you want to go with your buddies while they are taking game. Legal to bait for coyotes? Answer: Yes, the carcass of legally acquired wildlife may be used as bait when taking coyotes. It is legal to use feed, bait or other material capable of attracting coyotes and other nongame animals unless you’re hunting these animals with the assistance of hunting dogs (California Code of Regulations Title 14, section 475(e)). This entry was posted in Bag Limits/ Possession, Catch & Release, Firearms/Ammunition, Fishing, Hunting, Info, Recreation, Regulations, Wildlife Encounters and tagged ammunition, bairing, bait, behavior, big game, big game hunting, disabilities, firearms, fishing, freshwater fishing, Licenses, lights, nongame mammals, nuisance wildlife, ocean fishing, photography, regulations, salmon. Bookmark the permalink.